Dr. Hitwant Sidhu has had a long and interesting life and career as a teacher and sports official in two countries, first in his native India and then in his adopted homeland, America, specifically Indiana. In this book, illustrated with more than two hundred photographs, Sidhu writes simply and candidly about his multifaceted life, beginning in Punjab in the 1920s, his education there and, following what seemed to be an impossible “dream,” in the United States. Supported in his endeavors to receive an education by family members in India and a wide circle of friends in America, he earned a doctorate in physical education at Indiana University. After marrying Pushpa Duggal in a successful “arranged” marriage, he taught in India and then returned to Indiana, along with his wife and their two beautiful daughters, Rachna and Rashmi, in the 1960s. Soon after Sidhu became a successful and popular professor at a new university, Indiana University Purdue University Indianapolis. 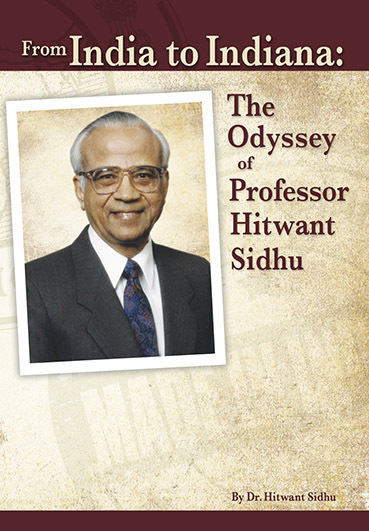 In a life filled with countless encounters with political and academic celebrities, ranging from India’s Prime Minister Jawaharlal Nehru to Indiana University’s President Herman B Wells, Sidhu remains humble and approachable, and tells all here about his fascinating “odyssey” over the years.